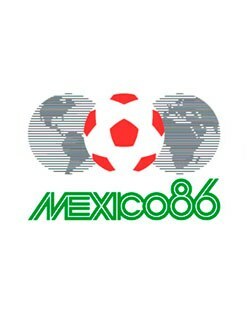 The 13th World Cup was played in Mexico from 31 May to 29 June. In the final phase of the FIFA World Cup 24 teams were participating after a qualification that included 121 nations. As host nation, Mexico was automatically qualified. The 13th World Cup was actually planned to be arranged in Columbia, but a country in economic crises decided to back out of the large arrangement. The United States and Canada wanted both to take over as host nation, but Mexico was chosen. A controversial decision since Mexico already had been the host once and rather recently as well (1970); money had a big role in the outcome. The hostship of Mexico was however in jeopardy after a major earthquake in Mexico City, causing thousands of casualties eight months before the tournament. But the country managed to go through the event in line with plans. Among the anticipated stars of the tournament were Enzo Francescoli, Michel Platini, Karl-Heinz Rummenigge, Gary Lineker, Hugo Sánchez, Michael Laudrup and Diego Maradona. It turned out to be Diego Maradona’s World Cup and perhaps no player before had managed to raise above all other players in a World Cup tournament like he had done in 1986. The format consisted of a group phase of six groups (two teams from every group plus four third-placed teams advanced on) and a knockout phase. The knockout phase directly after a group phase instead of a second group phase meant a restoration of the set-up used in 1970 and several other earlier tournaments. 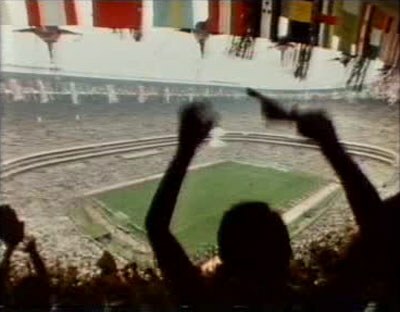 The 1986 World Cup was played at twelve stadiums in eleven cities. The biggest stadium was Estadio Azteca with capacity for 114 600 people and it became also the first arena in which the World Cup final had been played in twice). When the expansion to 24 teams had been implemented in 1982, two groups rounds been practiced. In 1986 a different format were used with 16 out of 24 teams advancing from the groups to a knockout stage. This resulted in two teams (Bulgaria and Uruguay) did advance to the knockout phase despite no won matches and one lost match. After all, the biggest sensation in the group phase was not Argentina, but arguably Denmark. In their first World Cup final ever, they won all games in the group phase, much owing to the team's attack consisting of Michael Laudrup and Preben Elkjær. The saga would abruptly end in the knockout stage after a 1-5 defeat against Spain. The home team boosted by passionate audience and the Real Madrid striker Hugo Sánchez would redeem the nation until a cold shower against West Germany in the Quarter-final. Engaged crowd before the premiere match with the home team. One of the high points of the tournament was the quarter-final match between Brazil and France in which France finally won after a penalty shoot-out. France would in the next match experience the ability of the West Germany to be best when it means the most. In the final West Germany was the underdog against Maradona's Argentina. FIFA World Cup 1986 would include 52 matches in which 132 goals were made (2,54 goals per match). Eight red cards and 135 yellow cards were shown during the tournament. Argentina, Italy, Bulgaria, Mexico, Paraguay, Belgium, Soviet Union, France, Brazil, Spain, Denmark, West Germany, Morocco, England and Poland succeed to advance from the group phase into the knockout stage. Argentina, West Germany, France, England, Mexico, Belgium, Brazil and Spain won the matches in the Round of 16. Argentina, West Germany, France and Spain won the matches in the Quarter-finals. 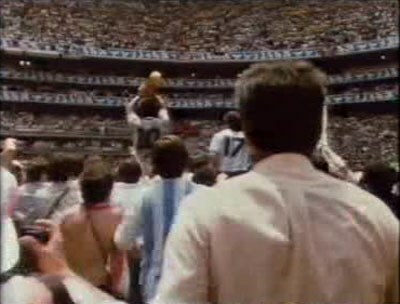 Argentina and West Germany won the semi-finals and would go to the final. France would beat Belgium in the third place match and Argentina defeated West Germany in the final with 3-2.